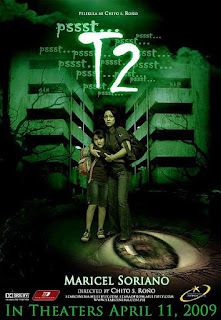 T2 or is a 2010 supernatural horror film produced and distributed by Star Cinema. The film stars Diamond Star Maricel Soriano. The movie was directed by Chito Rono, director of the critically acclaimed film Sukob. T2 refers to Tenement 2, one of the buildings in Brgy. Western Bicutan, Taguig City where some of the scenes were shot. In the movie, Maricel Soriano plays a Save an Orphan Foundation volunteer who brings an orphan home only to discover that the girl comes from a family of Engkantos.